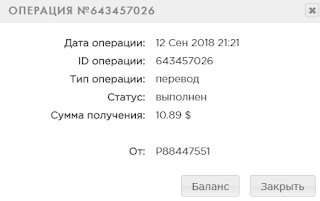 09.12.18 19:26	Account	Receive	+1.00	Received Payment 1.00 USD from account U7594488 to account U4731311. Batch: 228139569. Memo: Shopping Cart Payment. Withdraw to monitorinvestnet from Luxearn. 09.12.18 08:48	Account	Receive	+1.00	Received Payment 1.00 USD from account U7594488 to account U4731311. Batch: 228065368. Memo: Shopping Cart Payment. Withdraw to monitorinvestnet from Luxearn. The amount of 1.01 USD has been deposited to your account. Accounts: U7594488->U9620355. Memo: Shopping Cart Payment. Withdraw to indoinvestorclub from Luxearn.. Date: 18:44 12.09.18. Batch: 228135749. 09.13.18 20:35	Account	Receive	+1.00	Received Payment 1.00 USD from account U7594488 to account U4731311. Batch: 228263805. Memo: Shopping Cart Payment. Withdraw to monitorinvestnet from Luxearn. The amount of 0.5 USD has been deposited to your account. Accounts: U7594488->U1136717. Memo: Shopping Cart Payment. Withdraw to hyipsinfo from Luxearn.. Date: 19:57 14.09.18. Batch: 228377836. 09.14.18 20:54	Account	Receive	+1.00	Received Payment 1.00 USD from account U7594488 to account U4731311. Batch: 228382445. Memo: Shopping Cart Payment. Withdraw to monitorinvestnet from Luxearn.